Next generation sequencing of uveal melanoma (UM) samples has identified a number of recurrent oncogenic or loss-of-function mutations in key driver genes including: GNAQ, GNA11, EIF1AX, SF3B1 and BAP1. To search for additional driver mutations in this tumor type we carried out whole-genome or whole-exome sequencing of 28 tumors or primary cell lines. These samples have a low mutation burden, with a mean of 10.6 protein changing mutations per sample (range 0 to 53). As expected for these sun-shielded melanomas the mutation spectrum was not consistent with an ultraviolet radiation signature, instead, a BRCA mutation signature predominated. 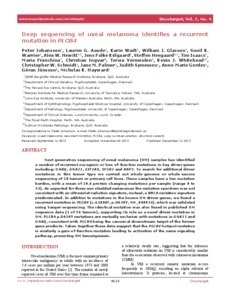 In addition to mutations in the known UM driver genes, we found a recurrent mutation in PLCB4 (c.G1888T, p.D630Y, NM_000933), which was validated using Sanger sequencing. The identical mutation was also found in published UM sequence data (1 of 56 tumors), supporting its role as a novel driver mutation in UM. PLCB4 p.D630Y mutations are mutually exclusive with mutations in GNA11 and GNAQ, consistent with PLCB4 being the canonical downstream target of the former gene products. Taken together these data suggest that the PLCB4 hotspot mutation is similarly a gain-of-function mutation leading to activation of the same signaling pathway, promoting UM tumorigenesis.